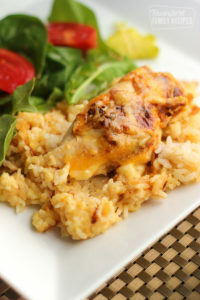 This Cheesy Chicken and Rice Casserole is an easy chicken casserole recipe for a busy day. Only a few minutes of prep work and the oven does the rest! Layer rice, 1 cup cheese, salt ,and pepper in pan. Place chicken breasts on top. Dob rounded teaspoons of cream of chicken soup over the chicken breasts and rice. Pour water on top and sprinkle with onion soup mix. Bake uncovered for 1 1/2 hours, checking water after 1 hour. If water is absorbed before chicken and rice are completely cooked, you can add an additional 1/2 c. to keep moist. Remove from oven, and stir excess sauce into the rice. Sprinkle with remaining 1/2 cup cheese. *If using brown rice, add 15 minutes to baking time.